This recipe has been compensated. All opinions are mine alone. I like making our morning routine super easy, especially for my kids, but I’ve noticed they’ve been skipping breakfast lately. I think they’ve grown tired of oatmeal and cold cereal, so this week I’m planning a frozen breakfast menu. The menu is set up so that they can eat at home or have breakfast on the go. The first thing I do is cook the eggs and turkey bacon. I cook the bacon on a baking sheet in the oven at 400 degrees for about ten minutes per side. I also whisk my eggs and pour them into a baking dish and bake at 400 degrees for about 15 minutes, or until the eggs firm up. Don’t forget to add salt and pepper. Then I remove the bacon and eggs from the oven and allow them to cool. Once the eggs and bacon are cool, I start cutting the eggs into even squares. Sometimes, I take this recipe a step further, by using a large cookie or biscuit cutter to create circles from the cooked eggs to fit the size of the waffles. If you don’t have a cuter that size, you can also use a glass or cup to create circles. Once my eggs are cut to size, I cut each slice cheese and cooked bacon in half so that it will fit in the waffle. Now, I warm my griddle on medium heat before moving on to the next step. Here comes the fun part. Starting with my waffle on the bottom, I then add a half a slice of cheese. Now I add a half slice of bacon and then my egg. Next, I add another half slice of bacon, a half slice of cheese and another waffle on top. By now, my griddle is hot, so I butter the entire surface with one tablespoon of butter and begin placing my waffle sandwiches on the surface. I cook each side until golden brown and the cheese is melted. The melted cheese will help hold everything together. 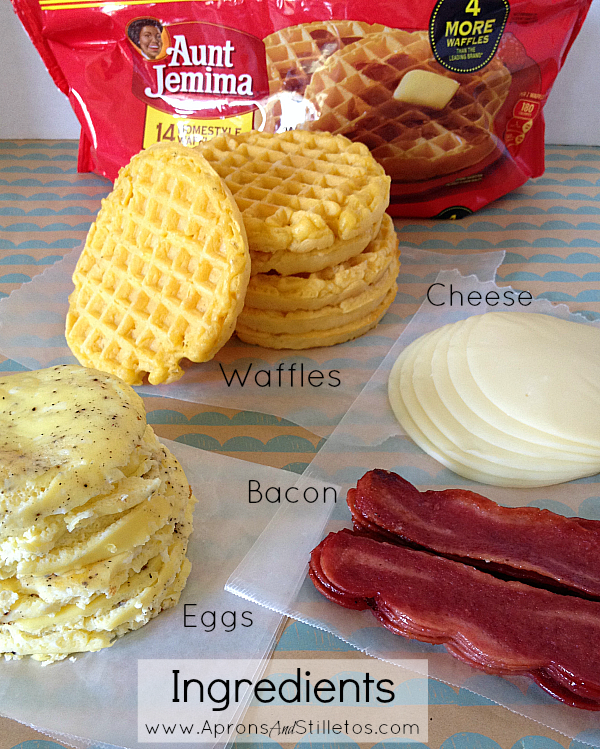 This is especially important for breakfast on the go sandwiches. Once my sandwich is golden brown, the kids can enjoy them. Now, let’s say I’m making these ahead of time for the week, at this point, I’ll let them cool, then wrap each one in freezer paper. When the kids need one, they can just grab, heat and go. Let me just end by saying, these were delicious! For more fun breakfast, lunch and dinner recipes take a look at my latest creation or save this recipe for yummy whole wheat pancakes. Waffles are usually what my family wants for a delicious breakfast. I like a more savory breakfast with bacon and eggs. For us busy moms, breakfast on the go is something that can make our day more lighter. 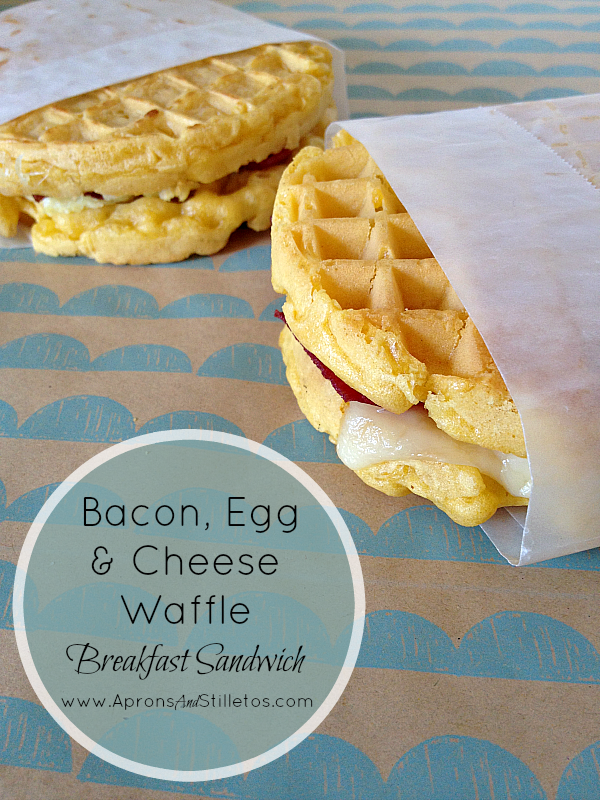 These waffle sandwiches will definitely do the trick in serving our children delicious breakfast. Even the Essayshark writers are requesting this particular food from their moms. And to think I've been buying them premade… I'm going to make them like this from now on! What a fun idea! Now I'm famished. These sound so much fun for kids or adults. I once made a peanut butter and jelly sandwich with waffles, but this sounds awesome! My boys would love this! These look absolutely delicious! Today at work we were discussing quick and easy foods we could freeze for breakfast or lunch! This fits the bill perfectly! I think I might even like these. I tend to skip meals a lot–and having a stash of these in my freezer would be a quick meal before I start running again. Thanks for the suggestion for a healthy grab and go breakfast! My husband and I can really use this because we rush off to work everyday. What a great idea. I tend to grab a juice or smoothie on my way out to the gym first thing in the morning but by 10 I'm starving! I need something quick and easy since I'm immersed in work by then so this is a perfect solution. Thanks! These lok amazing and such a great idea for those busy mornings! 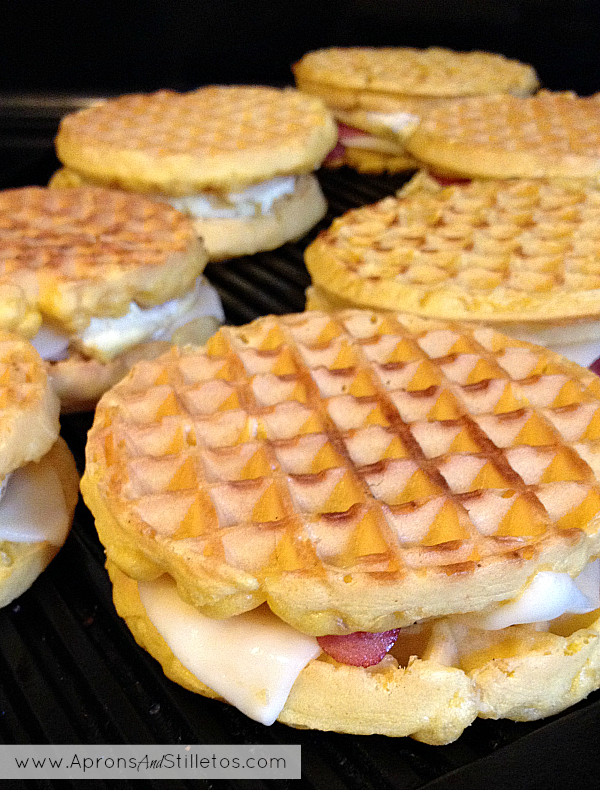 We've made breakfast sandwiches with waffles and they're fun. I love the idea of freezing them ahead of time. How do you suggest these get reheated? Love this ideas! 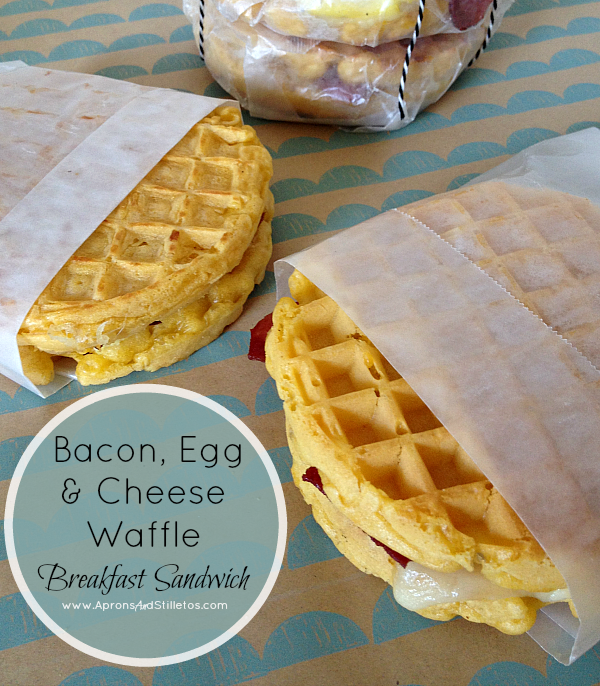 We love waffle breakfast sandwiches! My kids love breakfast burritos. Which I make in bulk and freeze. Previous Post DIY Sparkly Container | for your vanity, desk, bathroom and more! !